A farmer’s breakfast is considered to be hash potatoes, bacon or sausage and eggs. Applying this idea to a tart using chicken breakfast sausage and a lovely goat cheese with baked eggs certainly was a delicious alternative. The goat cheese we used was Murcia Al Vino. It is a firmer, smooth and buttery cheese made from goats indigenous to the Murcia region of Spain. This region has a rich variety of grasses, shrubs, and wild herbs on which the goat’s graze to give the cheese a distinctive taste and aroma. The unique feature is that it is washed in red wine during ripening. We have been buying various wine tinted goat cheeses known as winey goat, drunken goat and syrah goat. The wine deeply tints the cheese, giving the rind its characteristic burgundy color and imparting a strong floral bouquet. It not only has a bold, delicious flavor, it has the intoxicating aroma of a good bottle of wine. Heat oven to 400°F. Unfold the pastry sheet onto a baking sheet. Using a sharp knife, score a 1-1.2 inch border around the edge of the pastry. Prick the center of the pastry sheet thoroughly with a fork. Stir the yogurt, cheese and potato in a medium bowl. Spread the potato mixture in a thin layer on the pastry sheet to the border. Season with salt and black pepper. Bake for 15 minutes. Arrange the sausage on the pastry. Carefully crack 1 egg into each corner of the potato mixture. Bake for 10 minutes or until the eggs are softly set and cooked to your liking. Sprinkle with green onions and additional cheese if desired. I wouldn’t mind waking up to that breakfast! Honestly, who wouldn’t love a tart with drunken goat cheese?! This looks like a fabulous breakfast, Seana, and I bet so versatile as I could probably substitute ham for sausage and maybe add a few sliced cherry tomatoes. I’m excited to make this because we love our breakfast around here. You could substitute ham easily with this tart and add sorts of wonderful veggies too! Love the cherry tomato idea though. Like you, we love our breakfast too! The weekend breakfast is such a lovely time with the family around the table. I cherish those moments. Breakfast can really be the best meal – and this looks like one of the reasons it is. Eggs and breakfast… my favorite words together. I think I know this about you Darya. I must of read somewhere how you love eggs for breakfast. Me too. I never tire of them and enjoy them in any preparation. Particularly poached! Now I would like this for breakfast! It’s a little difficult looking at blogs first thing in the morning. And especially seeing an appetizing breakfast post! This is truly appetizing Jovina. And easy enough to put together too. Oh my, that cheese sounds wonderful. I love drunken goat cheese. This tart looks dreamy. What a wonderful dish with a good bottle of wine. I like that you used Greek yogurt too. This is truly a breakfast of champions! Yum. I wish I could come over and have some of this with you! 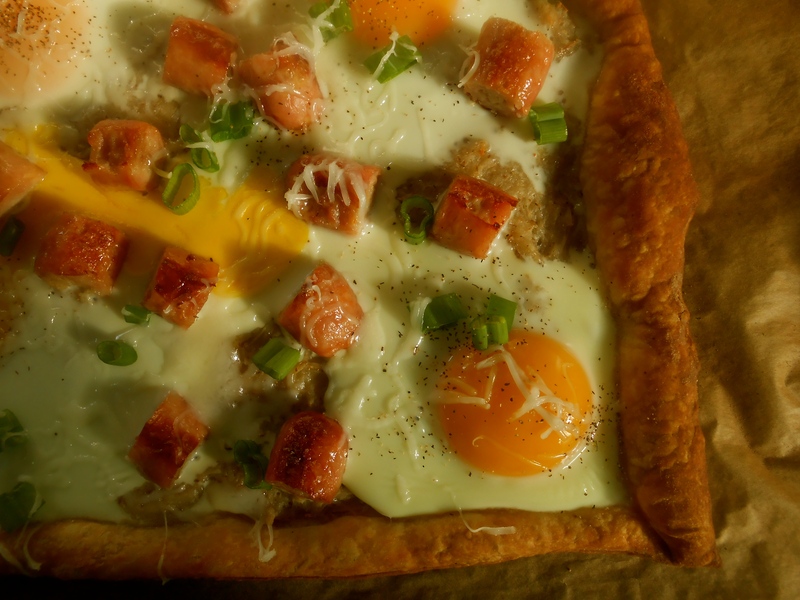 Breakfast is my all time favorite meal of the day, and this sounds wonderful, love how the eggs look on this tart. The cheese sounds delicious, love to eat local when in the area for this very reason. Hi Cheri! I really love baked eggs. They are wonderful when slow cooked and set perfectly. The tart really is nice. Have you ever made a breakfast pizza? Those are fun too with eggs cracked on top and left to bake. :) Fun breakfast food! Hi Lori…reading food blogs before breakfast is torture isn’t it! I find myself doing that often and get so hungry! It is sort of like grocery shopping when hungry. Everything looks and sounds so good! Wow…what a nice way to make breakfast special. Let’s make it Saturday. That way no one has to rush out to work or school! The morning light coming in our eastern kitchen doors is spectacular! A very welcoming effect! Really do wish we could share mimosas and a farmer’s breakfast tart together! I love the tart it’s wonderful and I am absolutely intrigued by the goats cheese. I have to find it, I am a huge fan of goat cheese of all varieties and have never heard of or tried this and i absolutely must. These cheeses are so wonderful! Unlike chevrie this goat cheese is slightly firm. Firm enough to use on a grater. It is so delightful. Whole foods will definitely have a nice selection! Winey goat is fairly common. Love it! Very nice my friend. I do like a good boozy cheese – goat or otherwise… it tends to go quite well with my boozy self! Ha! I’m with you… I remember the first time I bought drunken goat…only bought it for the name, of course! Loving this tart, Seana! I’ve had all kinds of goat cheese, but never drunken goat cheese! You have me so hungry for this tart, that I know it’s going to be a matter of a day or two before I’m serving it for dinner! Served with a lovely bottle of wine… now that’s my kind of meal! Yum! And thanks, because I never would’ve even thought of using puff pastry, but it makes perfect sense. Knowing you Dave you would just whip up a nice puff pastry on the spot! :) Me…store-bought! Great way to change up a sausage and eggs breakfast. Very enjoyable and a bit impressive too. Ha! Oh no, not me. I’ve seen enough impressive results as yours, whereas the only thing one has to show for a homemade one is being able to brag that it was homemade! Some things are better left up to Pepperidge Farms! Yes…I think I would use your local marinated Persian feta on a tart for sure! Hmmm, actually, now I think about it…feta would be fantastic on a tart with baked eggs! Rustic, colorful, and simple. I love this! The eggs with that pastry must have been divine. It really was a wonderful breakfast on a Saturday morning. I set out to make sausage and eggs and last minute I thought about the puff pastry in the freezer. Really went together nicely and I’ll make it again for sure. Thanks Lisa! I love the idea of consolidating everything on a lovely crust – well done! Well said! Consolidating. I like that. Thank you very much…really was delicious on the puff pastry. Although we do enjoy Drunken Goat I can’t help to think it is a bit like Kraft, just because of the packaging I suppose. I love sheep cheese! It’s my favorite. I always buy a little sheep and goat when I buy cheese. I prefer the mildness of sheep over goat. Hope you enjoy your Spanish aged sheep cheese! Sounds lovely. Exactly my point. I have been called a cheese snob once or ten times. :-) Soft goat cheeses and hard sheep cheeses from Spain and France are often aged and have lovely texture and flavor (bucherondin, 1+ year manchego), though Cypress Grove in the US has some outstanding fromage. On the first evening I very happily sat for over an hour at one of the cafés nearby. I am so glad you sent me the beautiful photograph of the Cathedral. It is awe-inspiring! I can only imagine the feeling you must of had standing before this building of great magnitude. And to imagine it was built between 1500-1700’s. Such elaborate detail. What a fabulous place to be, would love to visit someday. Took a look at some of your photographs on flickr. You have really seen the world! Fantastic experiences and stunning photography. Thank you for the link, I really enjoyed visiting your photo’s over a cup of coffee this morning! Not sure if the wine will change the cheese enough…well, maybe if you drank enough of it! :) I enjoy sheep cheese a bit more than goat, however, this particular one was quite mild for a goat cheese. It really had a wonderful flavor, must be from all the wild herbs the goats are grazing on in Murcia. Enjoy your week! Wow–that tart looks SO good! Absolutely tasty and good, Seana :) No need to take a lunch after eating a Rustic breakfast like this! :) Thank you! Love a pastry tart, especially a savory one in the morning. Wouldn’t mind waking up to this breakfast either, very interesting , this Goat Cheese, will have a look out for it! I know you love your cheeses Marie. Hope you find this type, it’s wonderful. A perfect, hearty breakfast to start the day. The wine-soaked goat cheese sounds divine! Hi Mary Frances. I have been reading your blog posts in my reader but I can’t seem to access your site to leave comments. This has happened several times now and i thought I would mention it. Has this happened with anyone else? Even if I enter your url it still won’t load. It says “server not found”. ??? Delicious looking tart you have made here I must say. I would like a slice for dinner please? More seriously though, this is my idea of a good weekend breakfast! Especially warm from the oven with an oozy deep-orange yolk. Breakfast with drunken goat, bliss! Oh gosh, what a great breakfast to share with friends– or for when kids are home to visit. thanks Seana! Puff pastry makes anything feel more like a party. Call it an alternative is not enough… this IS THE ALTERNATIVE! with that ingredients is really yummy, the eggs seem to be perfectly cooked! Don’t you just love baked eggs? They always turn out slow cooked and perfect. Thank you. I like to think of it as “thee” alternative. Was very delicious! A nice lunch of dinner works for me too! Thank you Sophie. I was very pleased with how it turned out. I didn’t know what to expect after cracking the eggs on top. I imagined a mess! Really was delicious and a nice presentation for s Saturday morning. Funny that I’ve read this today. I have a recipe using chicken sausage coming up soon! What a special breakfast you made. Your family is lucky. You are currently reading farmer’s breakfast tart at COTTAGE GROVE HOUSE.